I know you've all been waiting for this for a long time...after some long thought and against the advice of some business "advisors" that don't seem to grasp my relationship to you all, I've decided to take the incredibly exciting new FTO inhibition/uncoupling angle out of the Vanillesn upgrade and make DCP absolutely unbeatable. DCP just hit its 10 year anniversary, and it is by a long shot my most treasured baby. Instead of breaking this new research into multiple formulas that you would have to purchase separately, I've just decided to make DCP the best non-stim formula you will ever get your hands on. Ingredients have been ordered and we are looking at a June release. Awesome news! I remember the very first versions of this. What an amazing product it has been over the years. if I remember correctly you were one of my beta testers back in 2006. DCP was good...but DCP + Vanillean? I will be waiting. Would love to see ingredients on this!! So pumped for this. I loved the OG version - been waiting for this one! This release can't get here fast enough! Can we get an ingredient tease? There was a study posted on FB last night...one of the new ingredients is Panax Notoginseng. There is a synergy and overlap with the functionality of the Rose Elagitannins (same function as the Salvia Miltiorrhiza) to increase both insulin sensitivity and PPAR-alpha liver activity. More to come soon, but I have to time the full ingredient list with the writeup release, and the start of production for preorders. Subbed. So what is DCP exactly intended for? The new angle targets and inhibits expression of the FTO (more info here: http://www.nature.com/nature/journal/v464/n7292/edsumm/e100422-13.html), which also majorly increases activity of UCP1 ( uncoupling protein). The sum total is the ultimate non-stim fat burner that can also be stacked with all of the other fat burning/phenotype changing products in my line. Shortest answer? It causes your metabolism to behave like that of an elite athlete, while blocking the expression of an pro-obesity gene. You can find reviews on DCP going back 10 years...DCP is a superstar. Wow, thanks for the explanation Matt. It sounds like whenever I finally go into contest prep that EvoMuse is going to dominate my arsenal. I didn't see a place to subscribe to a thread, so I'm commenting to get notifications. Might be putting the cart in front of the horse, but anybody have any suggestions for a stimmed burner to stack with this? I'm almost done with my reverse diet....utilizing Epitome and Brite (and Alphamax). Gonna try to find maintenance and then build for a couple months....but for the subsequent cut this fall....I've already got my sites set on DCP. The cool thing with DCP is that it stacks with pretty much anything and you're not looking at an overlap on MoA or pathways. So whether you did that, something like Norcodrene/Alphamine, or anything else, they should all make for successful stacks. DCP run is scheduled for the week of June 25th. Look forward to a pretty fantastic July 4th sale! DCP to prevent getting fat on a bulk was amazing. Interested to see how it will help others with this new formula. I'll take a years worth please but in all seriousness I'm always willing to take risks with my $ when it comes to matts formulations. I'm really excited for the upgrade. Matt had been planning on revamping Vanillean for a while and the idea to include it in here instead was huge. 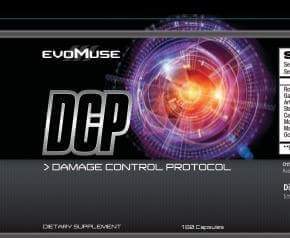 Just saw the Facebook post, I'm liking the label and the formula of this upgraded DCP. I'm going for a vacation at the end of August, so having this new upgraded DCP in my luggage will be put my mind at ease by then. Honestly, DCP is far from a risk. This stuff has been around forever and every formulation gets better. 2.0 was great. I honestly can't really even begin to expect what this next upgrade will be like with how solid it already was -- crazy stuff. Not gonna lie... on my little weight loss challenge I'm doing right now, I wish I could have stacked DCP with Invictus. Oh well, can't win em all! If you're looking for beta-testers, I'm IN!! Label correction: should read Quercetin-Theobromine cocrystals. So what effects are we going to expect from DCP? Not gaining weight after eating poorly ( like defuse)? 120mg of fuco? Holy hell. Is that a word? Or, should it be "Uncoupling proteins"? Should be uncoupling. Good catch.